How many Christmas stories are there? Home» How many Christmas stories are there? Andy Robb is an award winning author, illustrator and pastor. When CWR, my publisher, asked me if I would write a Christmas book in my 50 Bible Stories series my first thought was whether I could add anything to my previous Christmas products; Professor Bumblebrain’s Bonkers Christmas Comic and Crackers Christmas in my Boring Bible series. The other more pressing thought which crossed my mind was how on earth I was going to find fifty Christmas-themed stories in the Bible. Once you’ve exhausted Matthew, Luke, John and the various prophets you very quickly run out of what I’d call Christmassy content which might appeal to a child. And then I reminded myself that the entire Bible is centred around Jesus. From beginning to end the Bible is about Jesus in some way, shape or form and, because Jesus is at the heart of Christmas, there’s therefore no shortage of Christmassy Bible stories. Jesus was active in Creation, his coming was foreshadowed and prophesied throughout the Old Testament, his earthly life and ministry is revealed in the gospels, his acts are revealed through his church in the subsequent books and his return brings the Bible to a close. So, with that in mind I began to bring together passages from the Bible that spoke directly of Jesus or in some way referenced him indirectly. 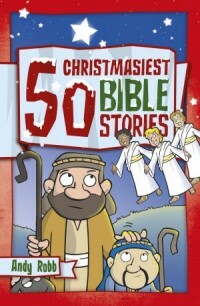 50 Christmasiest Bible Stories was going to be a book which helped children connect the familiar stories of Christmas to the bigger picture of God’s plan for humanity. For example, in ‘Christmas Adam and Eve’ I link the events in the Garden of Eden with Jesus, who the Bible refers to as the last Adam. ‘Dave the fave’ spotlights Israel’s shepherd king and makes the connection with the kingship of Jesus which, in turn, helps the child to make sense of that ever-popular carol, ‘Once in Royal David’s City’. ‘Holy Heads-up’ explains how the events surrounding that first Christmas were flagged up by God centuries before and reveal the reasoning behind the world’s most important advertising campaign. In keeping with the title I’ve also endeavoured to give each story a Christmassy feel be it in the illustrations that accompany it or the words used. Kids love Christmas and if doing this keeps them interested and engaged then it’s all to the good. I’ve also thrown into the mix Christmas traditions, myths, food and carols which in some way connect with Jesus. If you’re wondering whether the shepherds, wise men et al make an appearance, then fear not! They, along with all our festive favourites from the Bible, get a look in as well. And of course, as you’d expect with my books, there are plenty of puns and groan-worthy gags to keep things.